The history of the Catholic Church in Martin County dates back to the year of 1819 when the first Catholics - the O'Briens and Raneys - settled near Mount Pleasant. It is definitely known that in 1837 the visits of the priest were made monthly. Reverend Patrick O'Bryne offered Mass on these occasions in various homes, while taking care of churches in Logansport and Madison. Saint Rose was attached to Saint Simon's, Washington, as a regular Mission in 1844. In 1848, Father Patrick Murphy, residing at St. Mary's Barr Township, Daviess County, erected a church at Mount Pleasant. A "land craze" had led to the establishment of St. Rose. The people came from far and near to avail themselves of the farm lands that were being sold at unusually low prices. The poor farm lands were the first cause of the decline of the Parish, and another was the beginning of the construction of the line of Ohio and Mississippi Railroad through Loogootee. The Parish was finally dissolved in 1857, and the members north of Mount Pleasant were attached to the new Parish at Loogootee, while those living south were attached to the newly established Parish of St. Martin's. St. John's, Loogootee, became the largest Parish in the county after a very humble beginning in a small room above the Campbell - Breen Store. Mass was offered there in 1857 by a visiting priest from St Mary's, Barr Township, Daviess County, and later in a frame building belonging to a Mr. Gootee. 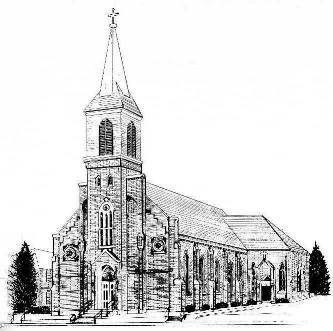 In 1858, Father John Mougin' who resided at St. Mary's, undertook the building of a church in Loogootee. The work was completed in 1860 and Father Mougin took charge of St. Mary's as a Mission. A one room school was added to the Parish in 1862, and a Rectory built for the priest in 1866. It was not many years until the rapid growth of the town and the increase in the number of Catholics necessitated the needs for larger buildings. Thus, in 1880, a new church was erected on the present site, and to this original building there have been many additions and numerous improvements. A new school, with two rooms on the first floor and a large auditorium for Parish activities on the second floor, was erected across the street from the present church. The building was destroyed by fire in 1968. In 1969, St John School consolidated with the Loogootee School System after 107 years of operation.